Tag nr. : 9 greenMicrochip: 900008800516747D.O.B. : 31-5-2012Bloodline: ZambianMeasured: 06-4-2016Horn length: L 25 1/8" R 24 7/8"Tip to tip: 11 6/8"Base: L 6 2/8" R 6 2/8"Rings: L 28 R 28Tips: L 8 2/8" R 8 2/8"Sire: Gravelotte 44 4/8". 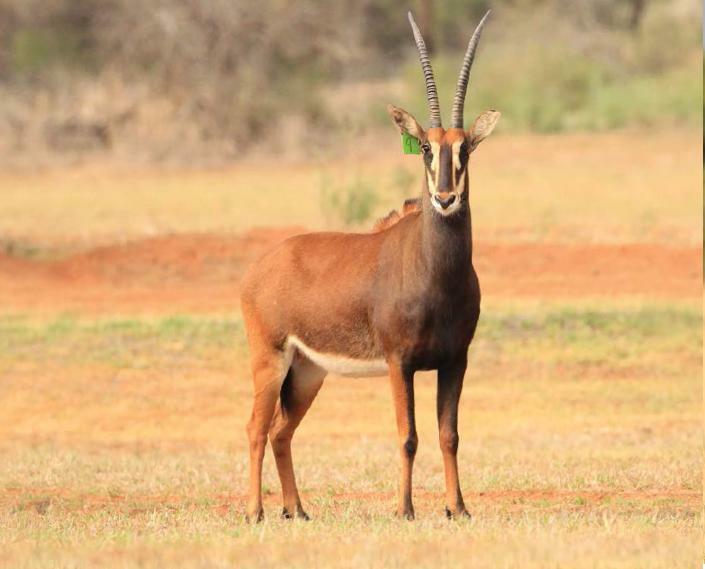 (Gemsbok PW Son)Description: 3-in-1 package, sold with heifer calf born 26-2-2016 sired by 44 4/8" Gravelotte (Gemsbok PW Son). Will be certified in calf to 44" Zambian bull David (son of Z46 Dinaka).Available: July 2016.